Description: BNSF 7630 leads an empty grain train eastbound in the last light of day at Crete Nebraska. 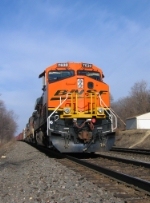 Description: BNSF 7630 leads three more locomotives on this train today. Description: BNSF 7630 gets the rollby from the Conductor of BNSF 5446 on this hot July day. Description: Conductor kept calling it "BN 7630". Description: Q380 rushes east with speed lettering. Description: Q381 westbound at CP 188. Title: NS Power Included Too.